I asked the check-in person for a room with 2 beds. She gave me a room that she said had 2 double beds. The room had ONLY 1 bed & it was not ready (not cleaned yet). I went back down & the check in lady did not believe me, but she gave me a room on another floor (2nd floor). That room had an ashtray in it & the room was supposed to be a non-smoking room. Also, the elevator would not take me back to the 5th floor (1st room they gave me) to collect my luggage & move it to the 2nd floor. I had to go back to the desk to get an extra card/key for 5th floor access. I don't need this type of hassle after being on the road & tired! Overall, the hotel was in great condition. However, I did not expect to receive the same room that I did three months ago around May with a leakage problem. Unfortunately, I was issued the same room with the same problem. I wished the Hilton Southwest staff attend to the problem. I ask front desk please move me to other room. They didnt have any room available. Hotel didnt look that busy. 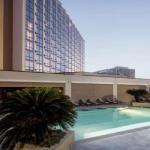 The Hilton Houston Southwest Hotel, a forty-minute drive from the Bush Intercontinental Airport, provides an assortment of modern comforts for convenience and confidence. Guests can take advantage of complimentary transportation to the Galleria Mall and nearby corporate offices; parking; and wireless Internet. An advanced security system, airline desk, car rental desk, concierge desk, ATM, gift shop, coin-operated laundry, business center and safety deposit boxes are a big plus. Hilton also offers notary public, secretarial and valet services for added convenience. The Texas Medical Center, George R Brown Convention Center, Toyota Center, Minute Maid Park, Reliant Stadium, the Galleria Mall, Lakewood Church, IMAX and downtown Houston are minutes away from the property. Each accommodation has a coffee maker, iron, ironing board, 21-inch color television, Nintendo games and two-line phones with data ports and voice mail. Guests of Concierge Level rooms can savor evening hors doeuvres, cocktails and continental breakfast. Wireless high-speed Internet can be accessed from all sleeping rooms. The Desert Rose Restaurant serves local food in a friendly ambience. Poquito Bar is an ideal place to enjoy cocktails. There is a fitness center, playground and outdoor swimming pool on the property. The onsite business conveniences include audio/visual equipment, fax machine, copier and printer. Travelers can take advantage of elegantly designed meeting rooms. This AAA-3 Diamonds property has everything for an enjoyable stay. A number of visitors were happy with well-kept bathrooms, clean spacious rooms with comfy beds, food, service, location and value for the money spent. However, some guests were disappointed with poor customer service, dirty dated rooms, slow elevators and mal-functioning shower.